George A. Romero has been scaring horror fans with his films for almost 50 years. His iconic first feature film was 1968’s Night of the Living Dead. Romero, also happens to be responsible for one of my personal favorite horror films of all-time, which I mentioned on our Horror Syndicate Live! podcast in episode 9. I am of course talking about the quintessential zombie film, 1978’s Dawn of the Dead. It has been a bit since I have done a retro review boils and ghouls. So, I wanted to dive deep into the annals of history of horror films with a more obscure George A. Romero film. After the incredible response to Night of the Living Dead, Romero brought us new take on horror. In 1973, Romero showed us what biological weaponry can do to a human populace in The Crazies. I recently grabbed an out of print copy of The Crazies on Blu-ray. It immediately jumped to the top of my “movies to watch” pile and I dove right in. Also known as Code Name: Trixie, The Crazies takes place in the small town of Evans City, Pennsylvania. We pick up immediately after a military biological virus is accidently unleashed into the area’s water supply. The ‘Trixie’ virus treats every person it infects in one of two ways, either through imminent death or leaving the person incurably mad. The film follows a small band of people trying to break the military’s quarantine to freedom. The main concern with the Trixie virus, you cannot tell who is infected until it is too late. The film stars Lane Carroll, Will MacMillan and a young Lynn Lowry (I Drink Your Blood, Cat People). Lowry’s portrayal of Kathy stole the show with her meek yet playful role. Kathy’s father Artie, is played by Richard Liberty. Who would go on to take the huge role of Dr. Matthew Logan in Romero’s Day of the Dead (1985). Being a low-budget affair as most Romero films are, the effects were practical and very effective. The film is a slow burn. But it is engaging. You are always wondering which character is infected and which one isn’t. It’s that sense of mystery that makes this a truly suspenseful horror movie. This movie was way ahead of its time. We saw the effects of radiation from the atomic bombs in Hiroshima and Nagasaki and the effects of Agent Orange in Vietnam. Romero, takes a manmade virus right into our backyard. A virus that makes murderously mad men and women run rampant. It is also a dramatic and horrific look at what our rights as Americans are reduced to in a police state. Herding people like cattle in order to contain the problem. People lashing out in fear to protect their property. This film is very multi-layered and full of political satire of the time. This is an amazing film. The Crazies was re-made in 2010 starring Timothy Olyphant. Remakes are never very good. John Carpenter’s The Thing is an exception. But this remake was actually pretty well done and keeps some the political ideas from Romero’s version intact. Most horror fans have probably seen the remake. But I encourage all to check out the much better predecessor!!! Thanks for reading boils and ghouls! 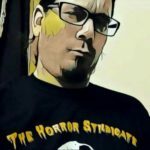 As always, LIKE and FOLLOW The Horror Syndicate for all you Horror needs! Rob Zombie’s 31 Out On Blu-Ray Today!